Fearful Harmony is an exploration of the relationship between designer and machine, speculating into the being of the latter as a means to delve into a different aesthetic and experience of our devices. © 2017 Alfred Hoi & Luke Hoban, All Rights Reserved. The machine is like an idle deity, all powerful yet waiting to be recognised by the user. But when the user acknowledges it, what kind of being does it play? Is it a cruel one, seeking nothing but the submission of the user. Is it lonely, only desiring to be closer and more intimate with the user. Is it bored, demanding the user to entertain it. Or is it angry for constantly being harassed, further refusing to fulfill the user’s wish. For a being that is relied on daily, what would truly happen when the machine grows to become larger than its creator and how could that change our interaction with it? OK Human is an experiment speculating how our interactions with our machines can carry emotions for it to register, while also reversing the role of the user, becoming the interface for the machine to interact with. For things that we have increasingly become more dependent upon, we fail to acknowledge their presence. We glare at them with no emotion and we tinker away without consent. The machine is a character awaiting a conversation. Our aim was to provoke designers into reconsidering their use and attitude with their devices, to show them that there can be semiotics behind every interaction towards the machine when we begin to think of it as a being. Does drawing our face closer to the screen signify us becoming more intimate with it? When we stare blankly at the machine, is that a sign that we’re unimpressed with it? When thought in this way, suddenly every action has the chance to convey a narrative with a being that was otherwise perceived as inanimate. For the experiment, again we looked to using the facial recognition program, FaceOSC, but this time in conjunction with Processing, a code heavy program used for creative purposes. Unlike Max 7, Processing allowed us to tap into Terminal commands, further incorporating the raw functions of the Mac into our script as well. What this lead to was a way to speculate how the machine could communicate itself to the user and to explore the form and body of our machine to influence and change the user’s interaction with it. We made the user interact with a projection and a webcam as a way to portray a machine that was larger than them. The personality of the machine was then portrayed via the speech function to give it a voice, along with the typojis displayed on the projection as a way to convey machine emotion. The receipt printer was less used to aid in the machine’s communication but rather to produce an artefact of the interaction between user and machine. We wanted to create a physical reminder for the user that they interacted with an animate being that was otherwise perceived as inanimate and to further provoke the speculation of the machine as a living, working material to experiment with. Finally the logic that was programmed into the machine to go through the emotions were carried out in a random order as a way to emphasise the sentience of our machine. Photo: Erich Koyama. 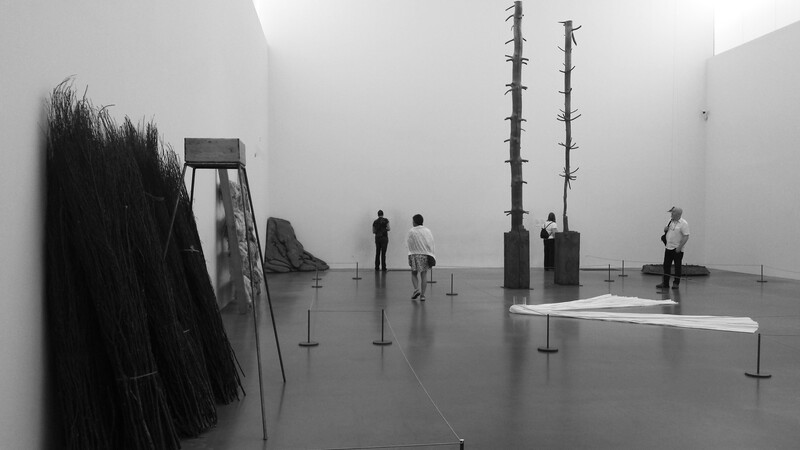 Courtesy Gagosian Gallery, Hong Kong. 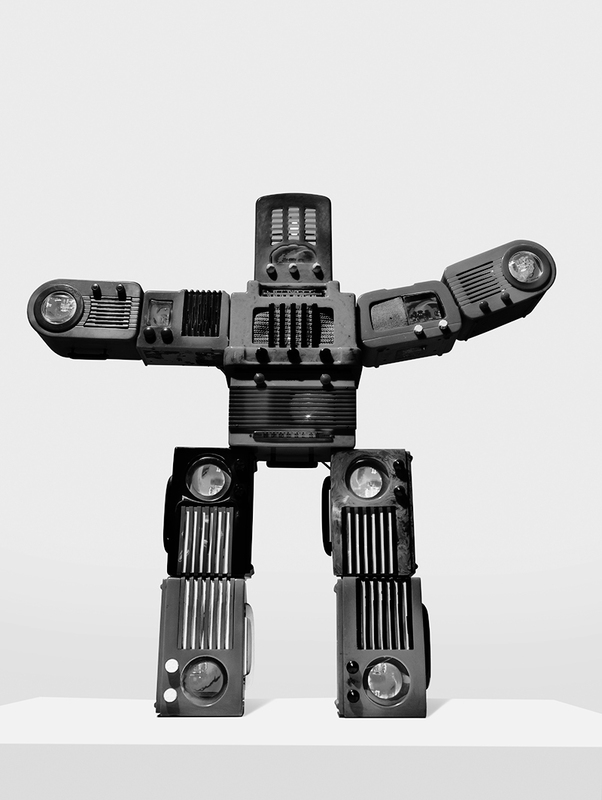 The sculpture ‘Bakelite Robot’ (2002) from artist Nam June Paik, was one of the main precedents for OK Human. The sculpture was built from nine bakelite radios to resemble a humanoid robot, where some of the radios were outfitted to display video footage in order to make it feel animated. We were interested in how Paik built a form that could influence how the audience perceived and interacted with his work, or rather, his machine. Hence in the making of OK Human, we used the concepts we understood from Bakelite Robot, to conceptualise a form for our machine to inhabit, as well as speculating how we could convey its emotions across, which was done via the typojis that were projected. Bakelite Robot was produced in 2002, late in Nam June Paik’s career, when the artist was working in New York. Acquired from thrift stores and markets, the radios in Bakelite Robot have a vintage appearance. Bakelite had been developed by Belgian-born chemist Leo Baekland in New York in 1907 and was one of the earliest plastics to be introduced into the modern home. It was favoured for its heat-resistant properties, electrical non-conductivity and the fact that it was inexpensive and hard-wearing, and was used in a number of products including radio and telephone casings, kitchenware and children’s toys–a fact referenced by Paik in his Bakelite Robot and its footage. Nam June Paik: La Fee Electronique, exhibition catalogue, Musee d’Art Moderne de la Ville de Paris, Paris 1989. Fearful Harmony is both an exploration of the relationship between designer and machine as a means to delve into a different aesthetic and experience of our devices. Thank you to everyone who was involved and helped on the way. A special acknowledgement to Lee Jensen and Tristam Sparks for the guidance and mentorship throughout the year.